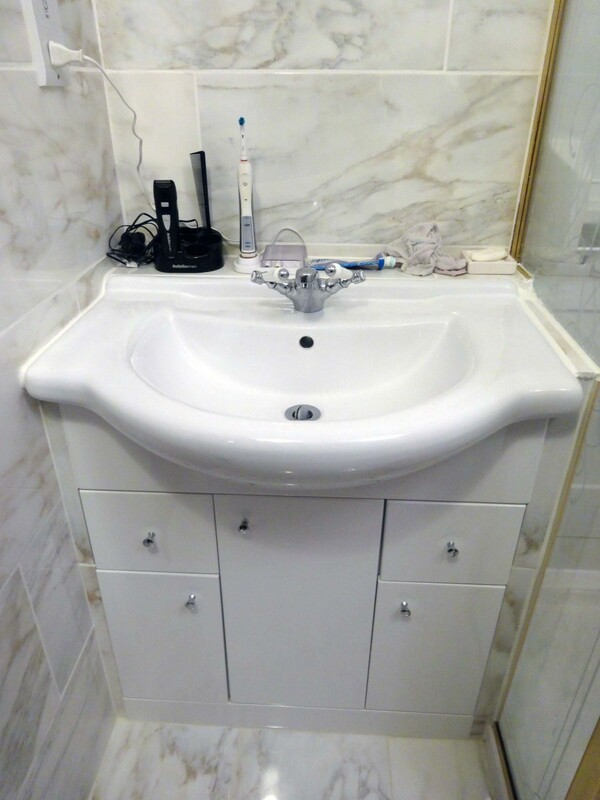 If you are intending to or thinking of buying items separately to design and build your own vanity unit and sink e.g. under mounting a vanity sink into an old stylish solid wood cabinet, perhaps by cutting a hole in the top of a substantial cupboard to fit the sink under, and tiling the rest of the top to make it water resistant; then you will also need stylish taps to go with it. This set of porcelain lever handle taps are not that dissimilar to the taps we purchased for our new vanity sink and cupboard. The time for make do and mend is over, having done little to our shower room over the years other than replace the shower unit, the flooring and a bit of decorating, it was time to drag it kicking and screaming into the 21st century. The old shower room, which we inherited when we bought the house and moved in, was quite nice but leaky. The original tiled shower leaked badly into the kitchen below every time we used it, the carpet tiles stayed wet and damp got into the floorboards below; and the walls were only half tiled. d swelled; which was the cause of the leaky shower. 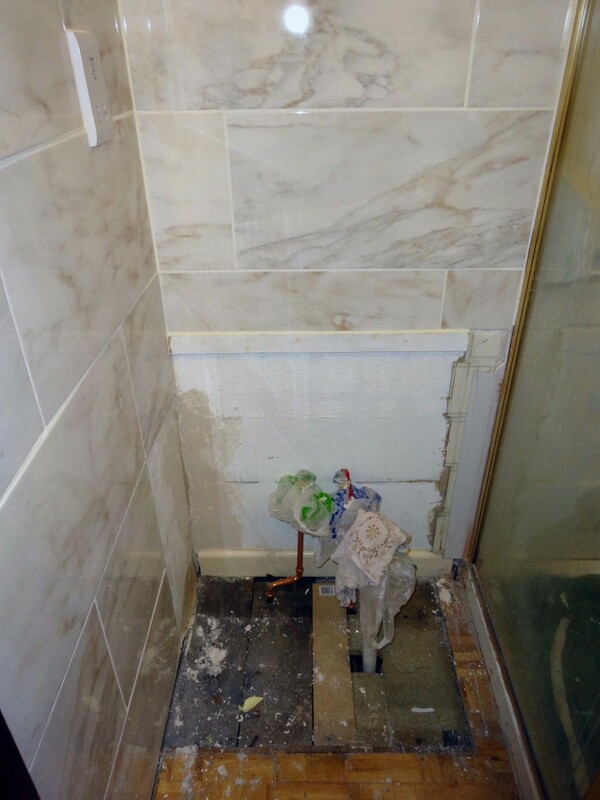 I also noted that the shower tiles were only fixed with ordinary tile adhesive not suitable for shower rooms and bathrooms which is why water penetrated through the grout between the tiles making the chipboard behind damp. A rather glamorous under mount vanity porcelain sink and with cupboard; not suitable for a small bathroom but in a large en-suite bathroom with period décor it would certainly be very grand. 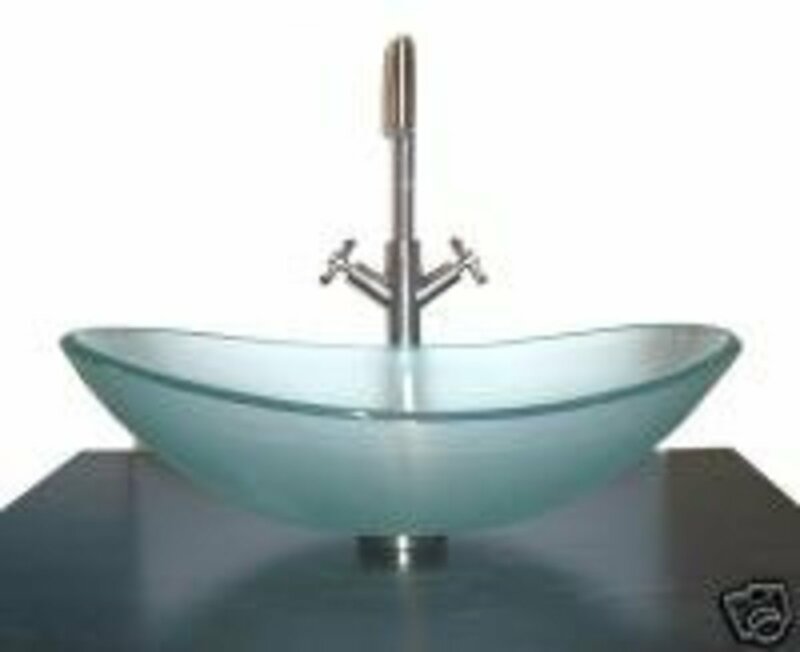 If you want a stylish wash basin in your bathroom, en-suite or guest bathroom, rather than a traditional, drab or cheap sink then a vanity sink and unit is a good choice. You could buy it all as a set and either fit it yourself or pay a professional plumber to fit it, or you could mix and match e.g. buy a sink and either buy or adapt the cupboard separately. 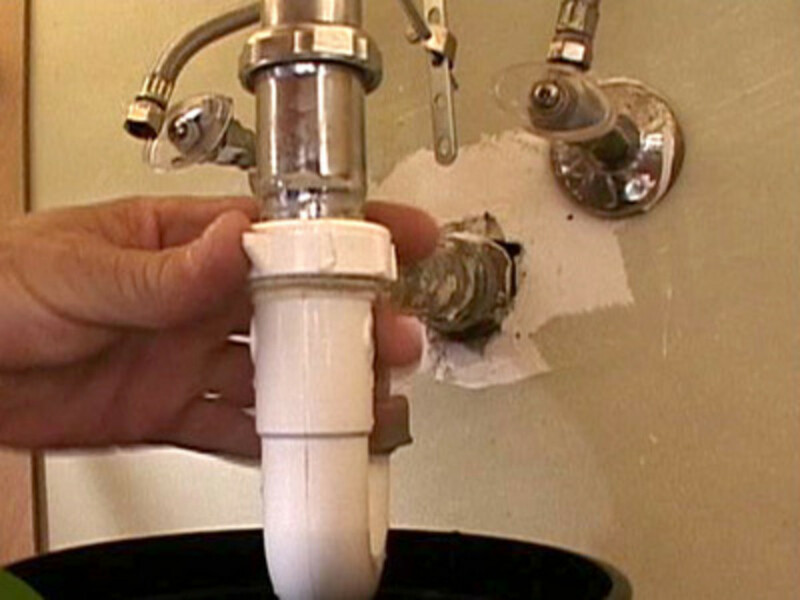 Usually you have to buy the taps separately anyway; which does give you the opportunity to get the taps you really want for your new bathroom sink. 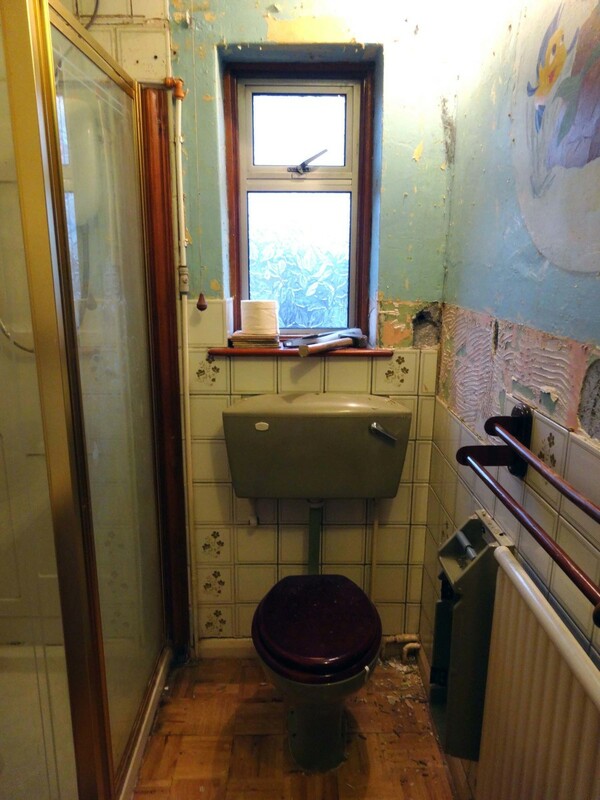 I recently renovated our shower room from floor to ceiling, pulling out and replacing everything except the door, Toilet and the shower cubicle itself; although we did replace the cistern to the toilet. 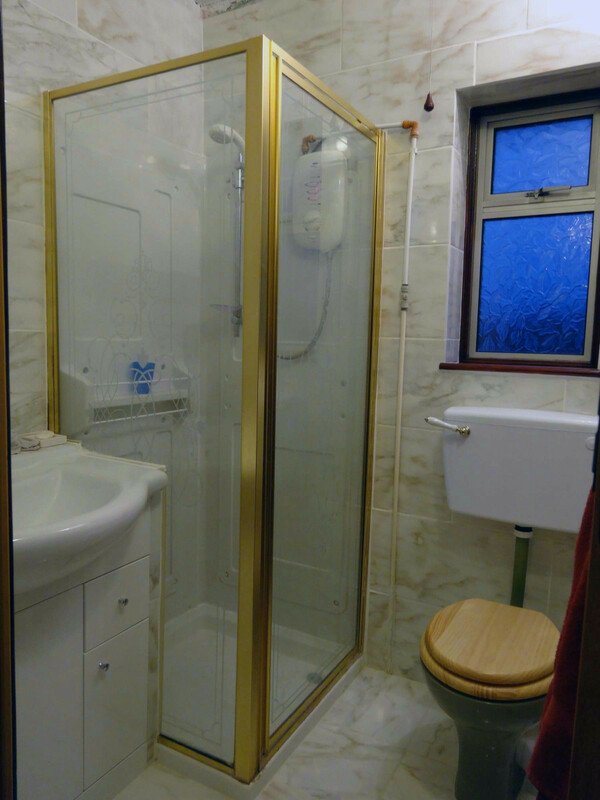 This is an overview of how we approached the task of modernising our shower room including before and after photos as guidance. The areas highlighted in this makeover includes retiling the walls, tiling the floor, replacing the old radiator and towel rail for a modern heated towel rail, repurposing the old towel rail for a toilet roll holder, replacing the cistern and replacing the old wash basin and under sink cupboard, and bathroom cabinet. Repurposing the towel rail for a toilet roll holder and making a new bathroom cabinet are given in detail in two separate DIY articles. The objective of this DIY project was to modernise our shower room on a low budget, making it modern, functional, waterproof and easy to keep clean; we achieved all of this. 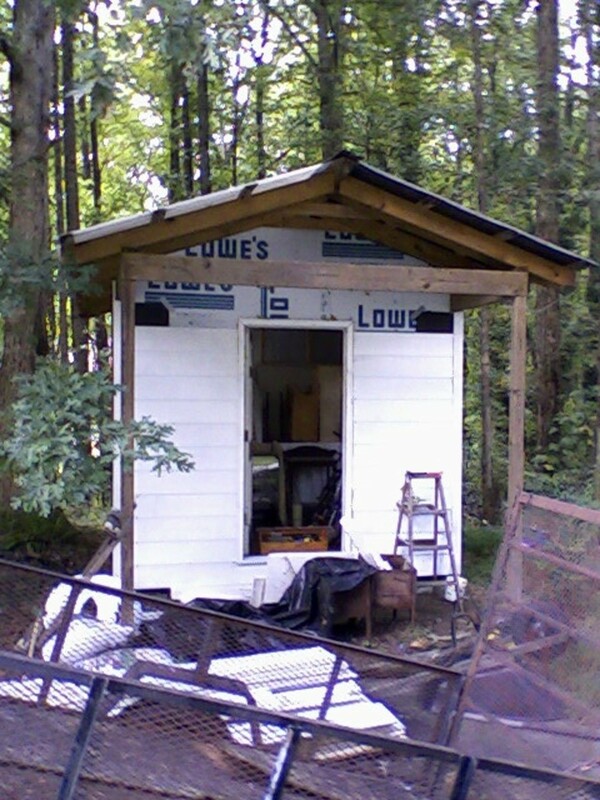 Our budget, on costing up the materials, was 1000 ($1675), with no labour costs as I did all the work myself. As it turned out, we happened to buy our materials during the January Sales and in doing so were able to make substantial savings to our budget e.g. 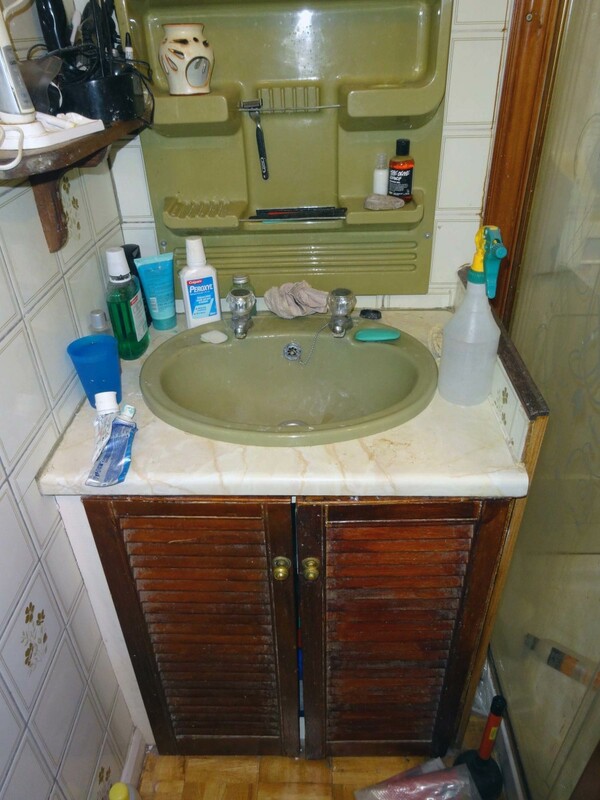 the vanity unit and cupboard had been on sale for the previous two years for 280 so we were delighted to see it reduced to 150 when we went to go to buy it. We also made substantial savings on the tiles and the heated towel rail; both in the January Sales. With all the savings we made from buying during the January Sales the final cost for the whole project came in at just 700 ($1173). Before photo of the old towel rail, radiator and the tatty cheap plastic toilet roll holder. 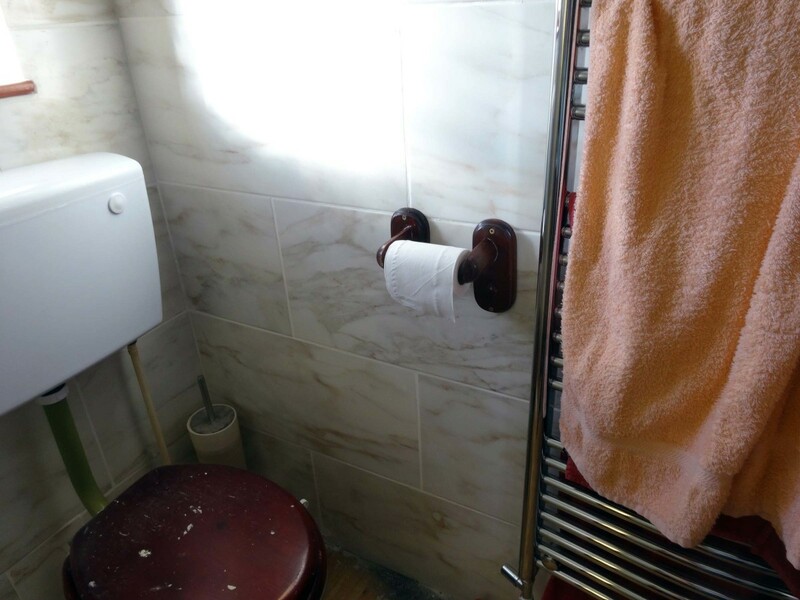 The towel rail and radiator are to be replaced by a new heated towel rail with the old towel rail being repurposed for a new toilet roll holder. As the new heated towel rail is slightly wider than the old radiator, and as I wanted to move it closer to the door, it was not a simple case of replacing one for the other; some re-routing of the pipework would be required. A professional plumber would rip-up the flooring to gain access to the pipes under the floorboards and make the modifications using soldered joints. DIY enthusiast would most probably opt for using compressions joints. However, plumbing is not my forte so I was looking for the easiest suitable option which would exclude ripping up the flooring if possible. My desire to keep the existing flooring intact was primarily finance in that we had decided that we would tile the floor as well as the walls, and the floor tiles would require a solid base; but not floorboards. 3/4 inch (18 mm) exterior plywood would be ideal as (unlike most woods) it is resistant to shrinkage and expansion, although laid over the floorboards the existing wooden floating floor (suitable for bathrooms) with the right tile adhesive is a good second choice. 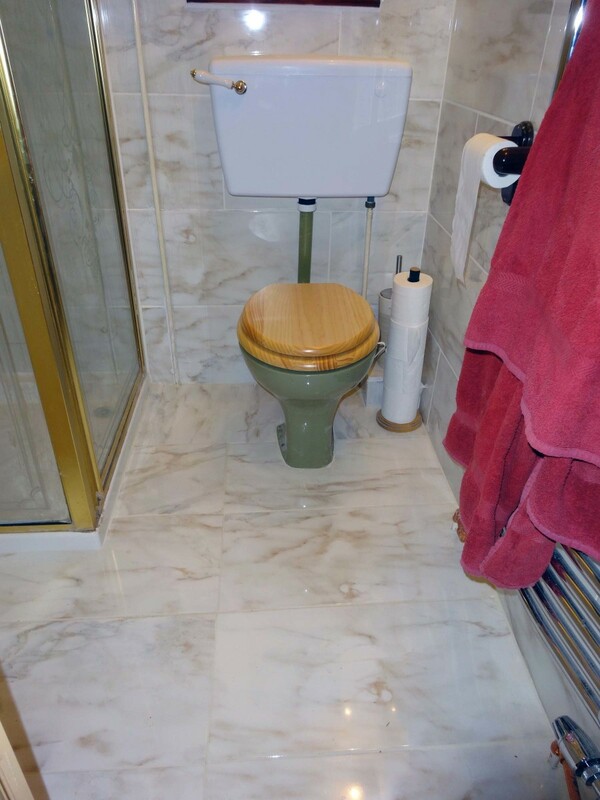 During my inspection of the shower room, to make a detailed plat of what needed doing as part of renovating the shower room, I noted that although the toilet itself is sound, the toilet seat needed replacing along the old cistern. In plumbing terms this was the easiest and quickest plumbing job of the lot as the new cistern we bought was a similar size and style and all the entry points for all the plumbing were in the same place. The only difference is that the new cistern cleverly uses the outlet pipe as the overflow pipe making the old outlet pipe redundant and unlike the old cistern which was fixed directly to the wall and tiled around I wanted to tile the wall first and fix the new cistern to the tiles. Apart from chasing the power cable for the shower into the wall and removing the wood trims on either side of the shower unit, there was little else that needed to be done to the shower unit itself. The only other job I did here was to remove and replace the silicon seals around the shower tray using bath sealant. In using the sealant, to get a good seal, and a good finish, once the sealant has been run along the area to seal dip your finger in warm soapy water and quickly run your finger along the sealant. The old plastic tatty bathroom wall cabinet and tacky plastic wash basin I have wanted to replace for years. For the wash basin, I had seen a vanity sink and under sink cabinet in a local DIY store for a couple of years that would be just perfect for this project. In replacing the old wash basin and under sink cupboard with this new vanity sink unit rather than having the water and waste pipes going through the inside of the cupboard (wasting valuable storage space) I had in mind to bring the new sink out from the wall a few inches and re-route all the pipework to go underneath and behind the new cupboard. This would require some re-plumbing; but well worth the effort. 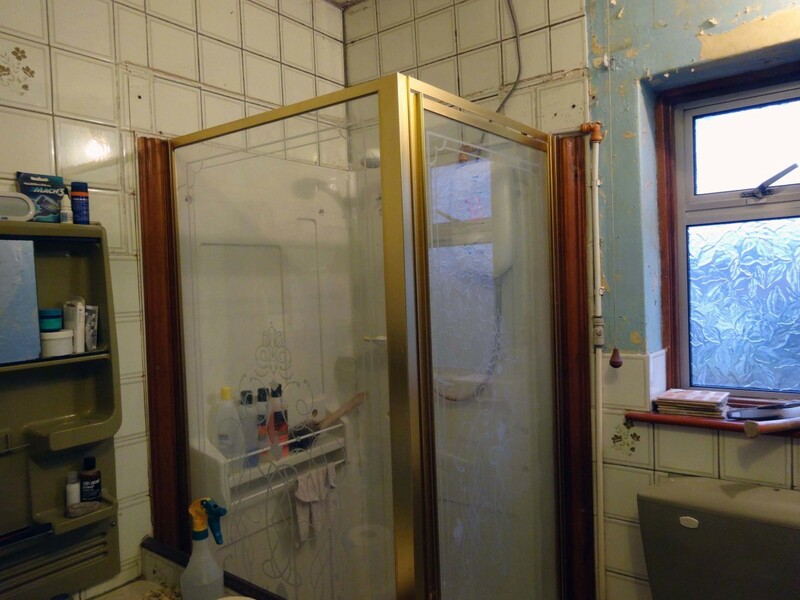 The sequence of task for this shower room renovation project was split into phases, with some phases requiring no heating or water for one or two days. Ideally it would have been better to have waited until the summer before tackling this DIY project. However, as I already had a major project lined up for the summer, an outside job that requires good weather (if that is possible in Britain these days) then we decided to press ahead with this project over the cold stormy winter months; minimising the impact of no heating and water with the use of risk management. My wife took charge of the risk management. It has been a while since I have done any plumbing, last time I found the plastic Speedfit fittings extremely handy, as were the flexible connectors; ideal for fast and easy plumbing of taps for hot and cold water. However, I was concerned on whether such fittings would be suitable for central heating plumbing. In doing my research on this point I discovered that there is some controversy over their suitability for central heating; although I did stumble across copper pushfit elbows which are just as easy to use as their plastic counterparts but which are suitable for central heating. Therefore I ordered some of these along with a length of copper pipe and used these to reposition the new heated towel rail to where I wanted it. It may not look like a 5 star hotel but it is functional, and I quite like the look of copper piping provided it is not painted. When fitting the heated tail rail itself you mad need to buy radiator valve tails and valves separately. We bought a set complete with a lockshield valve, a TRV (thermostatic Radiator valve) and radiator valve tails for both. I also bought some PTFE tape, essential in ensuring a leak free connection for the compression fittings. The purpose of swapping out the old radiator and towel rail for a modern heated towel rail was that it would look better, take up less space and be more functional. Yes it does look a lot neater and takes up less space, but I did wonder how functional it would be compared to the old radiator and towel rail. 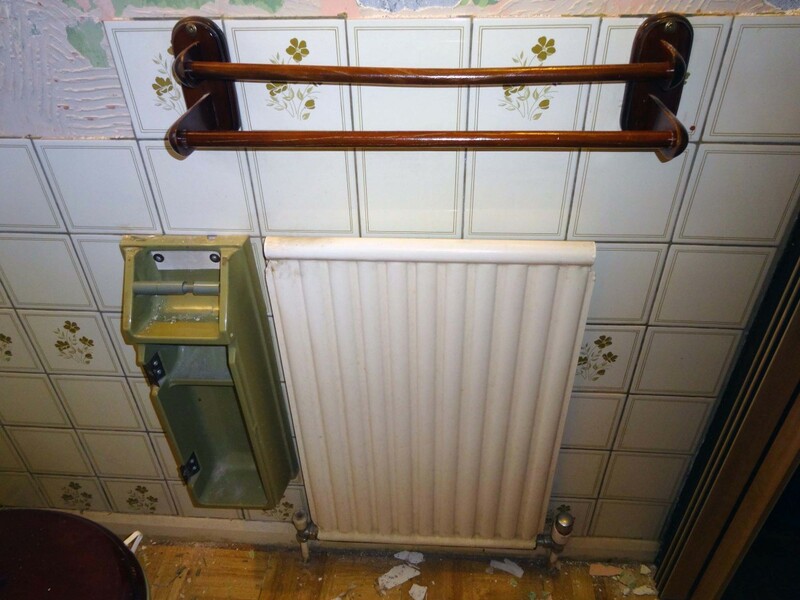 The old towel rail had two rods (one set behind and lower to the other) which enabled four towels to be placed on it above the radiator; albeit the back rod was less accessible than the front towel rod. 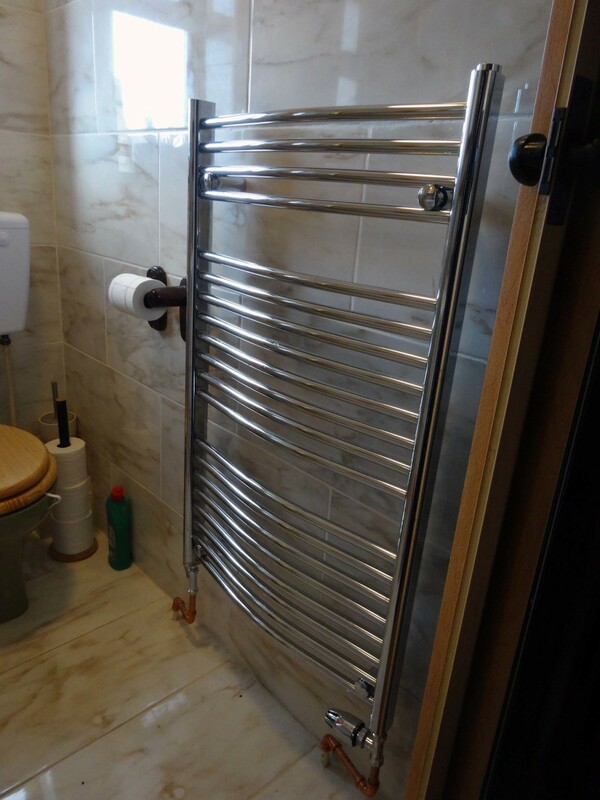 And although the new heated towel rail has three towel rails, if you fitted it in accordance with the manufacturers the full use of those towel rails are a little restricted by the four wall support brackets because they are meant to be set in a few inches on either side not leaving much space in the middle to place towels. However, in researching the web for tips on fitting heated towel rails I did come across good sound advice where provided they are securely fixed to a good solid wall the brackets can be fitted close to the edge of the heated towel rail. So this is what I did, and because our heated towel rail is curved (and not straight like some models) the added advantage of fitting the wall brackets close to the edge is that it pushes the whole radiator out away from the wall by about an half inch which gives more space behind the towel rail to get the towels in. The bottom towel rail is quite close to the bottom of the heated towel rail, and next to useless if you fit the heated towel rail close to the floor; so again following tips from the Internet, I raised the bottom of the new radiator off the floor by a suitable height to make the use of the bottom towel rail practical for keeping the shower mat when not in use. 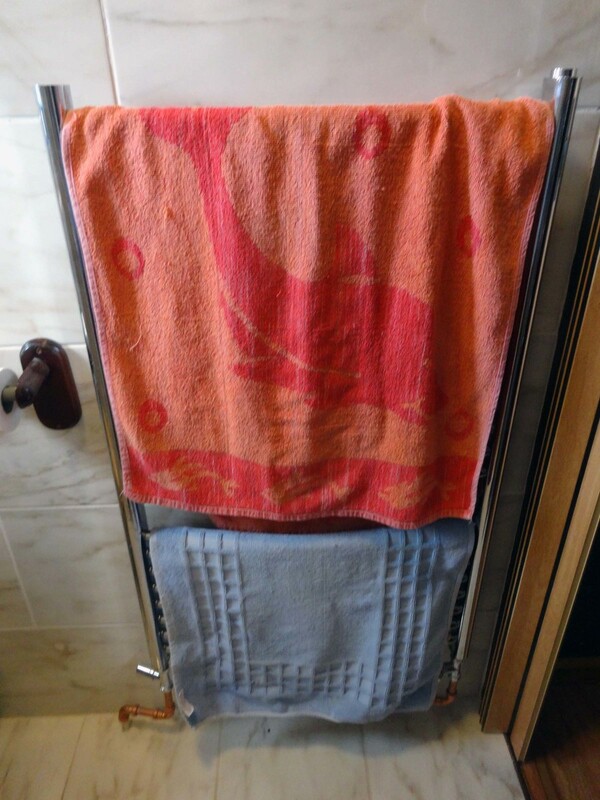 The shower mat is like a bath towel but not as long and thicker so that when placed outside the shower cubicle it absorbs most of the excess water from you as you step out of the shower unit; preventing the floor from getting soaking wet. The large tub of tile adhesive was just the right height to sit the heated towel rail on for marking up the wall support brackets to drill the fixing holes and subsequently fitting it to the wall. Having fitted the new heated towel rail, before going onto the next phase in modernising our shower room with fitting a new radiator provision has to be taken to clean and protect the central heating system. Firstly, by adding a bottle of Fernox F3 cleaner to the central heating water (just prior to refilling the system) and with the heating on allowing it to circulate around the system for at least one hour and up to five days. When we originally had our central heating system modernised with a new combi-boiler the plumber installed an inlet pipe close to the boiler specifically for this purpose. I let the Fernox F3 circulate around the system for about a day before draining the system and adding a bottle of Fernox F1 Protector to the system before refilling for the last time. Using the Fernox F3 cleaner and F1 Protector Fluids is a wise precaution to help protect the radiators and copper pipes by reducing the risk of future corrosion. Having tiled the other side of the shower room and installing the heated towel rail and new cistern the next phase of this DIY makeover was to tile this side of the shower room and replace the old above sink bathroom cabinet, wash basin and under sink cupboard with new. The tiling was fairly straightforward and at the same time I sunk the shaver socket (which was previously wall-mounted) into the wall to make it flush with the tiles. I did not tile behind the new sink and cupboard as that is completely hidden from view; and by not doing so it saved me three large (1 foot by 2 foot) tiles which I have kept for potential future use some other DIY project. 1. Before tiling I briefly turned off the water supply so that I could remove the old wash basin. 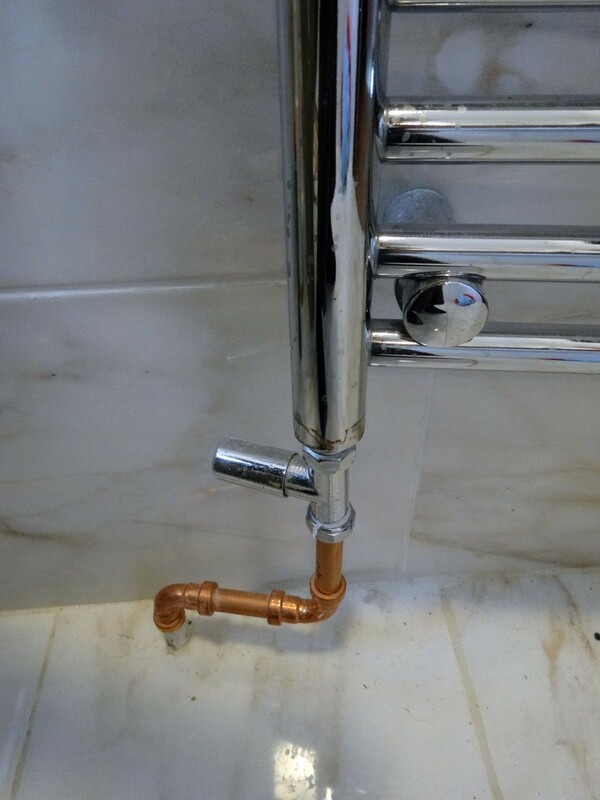 Using the copper pushfit elbows I quickly rerouted the hot and cold water pipes so that when the new under sink cupboard is fitted the pipework will be underneath and behind it. I then added isolated valves to both the hot and cold pipes before turning the water supply back on. To prevent debris from accidentally falling into the pipes while completing the renovations (and causing future problems) I wrapped plastic bags around the top and sealed them with elastic bands. Preparation for installing a new bathroom vanity unit and wash basin. 2. Having tiled the walls, and rerouted the pipe work to go under and behind the new under sink vanity cupboard I temporarily placed the vanity sink on the cupboard to work out and mark up the highest point at which the pipes could leave the sink and go out the back of the cupboard. I predrilled the holes at these point; making them slightly larger than the pipes to allow for some tolerance in fitting. I then positioned the under sink cupboard in place, five inches away from the wall specifically to give not just clearance for the pipes behind the sink cupboard but also to give me enough room to be able to lean over the top of the sink and join the pipes up (with push fittings) once everything was in place, and to be able to reach to turn the isolator valves on once it was all plumbed in. 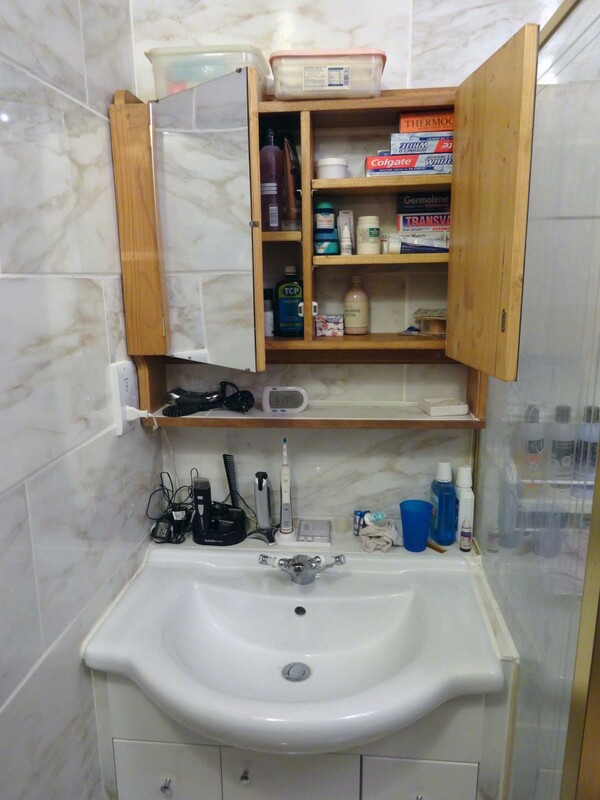 Having the sink five inches away from the back wall would also provide a much needed back shelf to prevent the sink area from being cluttered when in use. In positioning the sink unit I also placed a thin piece of wood on one side to stand the unit on to make it level e.g. being an old house the floors are not level. Installing the new vanity unit 5 inches forward of the back wall to allow water and waste pipes to be behind the cupboard, rather than inside. 3. Once the sink was plumbed in, as with when fitting kitchen units I added battens and a filler panel to sides of the vanity sink and cupboard to make them perfect fit; butting them against the wall on one side, and leaving a small gap on the other side so that no hard material would be butted against the glass of the shower unit. On the wall side I just used a batten as filler and on the shower unit side a piece of conti-board (chipboard) fixed to battens. snugly fitting the wash basin into the available space. 4. 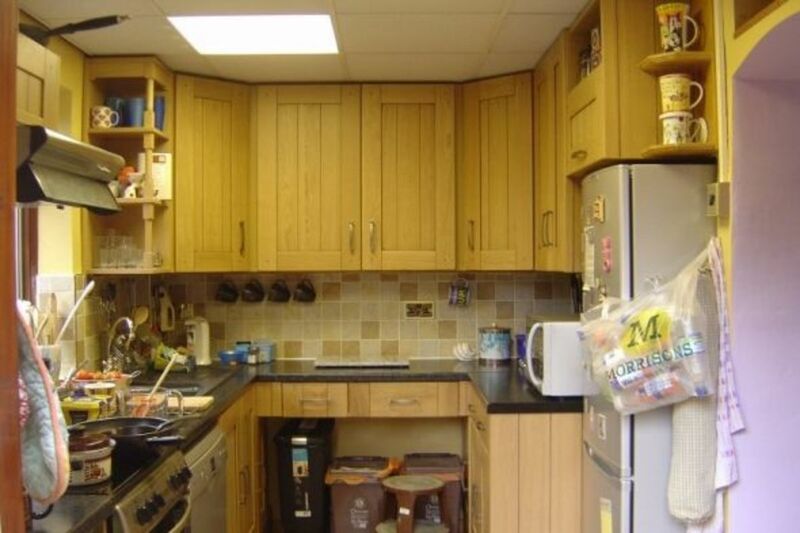 The battens and filler panel were not fitted flush with the face of the cupboard but set in to the depth equivalent to the thickness of the tiles and tile adhesive. 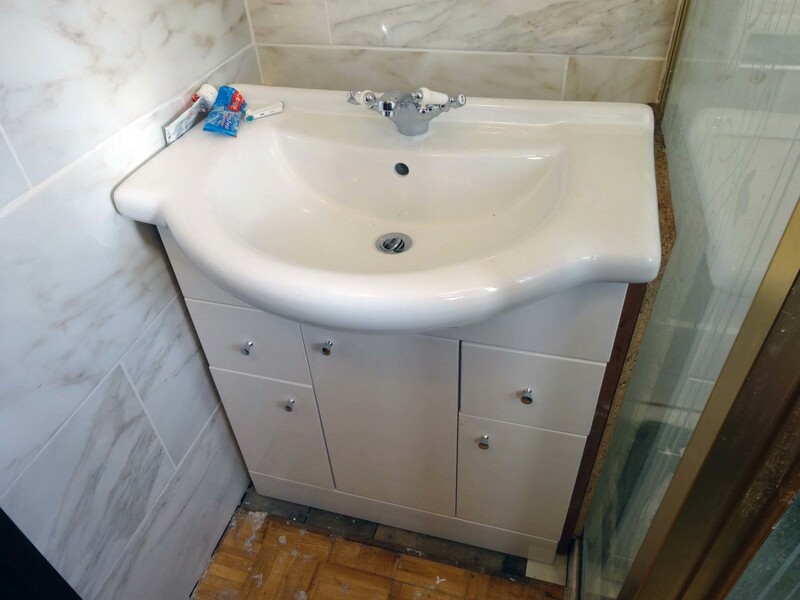 This provided a solid surface onto which to tile the surround (using the same tiles as for the walls) making the vanity sink and cupboard a built-in fitted unit. I also fitted and tiled a shelf behind the sink; making it flush with the top of the sink back. Adding a utility shelf across the 5 inch gap behind the wash basin. 5. Finally I fitted a self-adhesive plastic bath trim to the side of the shower unit around the vanity sink and cupboard sides and grouted the surround tilling; then finished off by tiling the shower room floor. The tiles we bought were wall and floor tiles so it made sense to use the same tiles for both walls and the floor. Adding trim around the basin and cupboard and tiling the floor. 6. The tap we bought for our new vanity sink came with a pop up waste. I did try fitting it but it was fiddly to fit, not very effective and leaked. Therefore I spent a little while on the web researching the different types of basin wastes and their pros and cons. Firstly, on reading blogs and reviews, it quickly became clear that pop up wastes all too frequently become unreliable with many people often replacing them with either sprung plugs or flip wastes; the old chain and plug waste being outdated and unsightly compared with modern alternatives. Therefore I researched both the sprung waste, which clicks open or shut when you press it, and the flip waste where the plug cleverly pivots in the plughole and you just push it open or shut. My conclusion (following all my research) was that at the moment the sprung plugs are the most popular but the simple flip waste is quickly gaining popularity because some people are experiencing the sprung plugs sticking after a couple of years whereas the flip waste is the simplest design with little that can go wrong. It was on this basis that we opted to replace the cumbersome pop up waste with the simple flip waste; which having now used we are extremely pleased with. 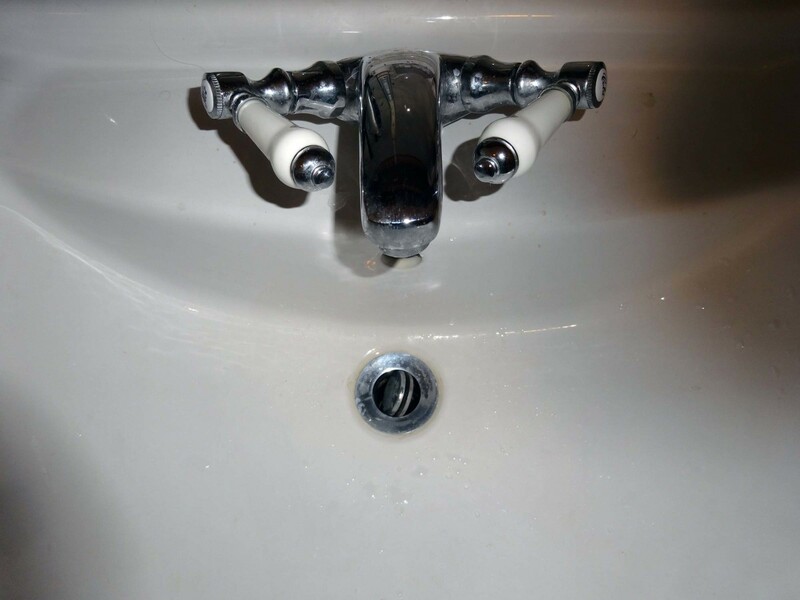 Flip waste fitted to the new sink. The specific reason we were keen to tile the floor as well as the walls was that the floor has always been an issue. When we first bought the house the previous occupant had used carpet tiles which were ok to a point in that they kept the floorboards underneath dry provided the amount of water getting onto the floor was minimal e.g. stepping out of the shower onto a shower mat. We replaced these with a wooden tiled floor which was meant to be suitable for bathrooms, and they did a reasonably good job but by no means water proof in the event of accidents. Therefore, using rather expensive floor tile adhesive suitable for swimming pools, which contains rubber and sand, and is fully waterproof, we laid the tiles over the existing wooden tiles (as a solid sub-floor). You cannot lay tiles straight over floorboards, they need to be laid on a solid level base that is placed over the floorboards; ideally 3/4 inch thick exterior plywood which is resistant to shrinkage and expansion, although by using the tile adhesive we used (with the high content of rubber, keeping it pliable) laying them on the wooden tiles we had was acceptable. 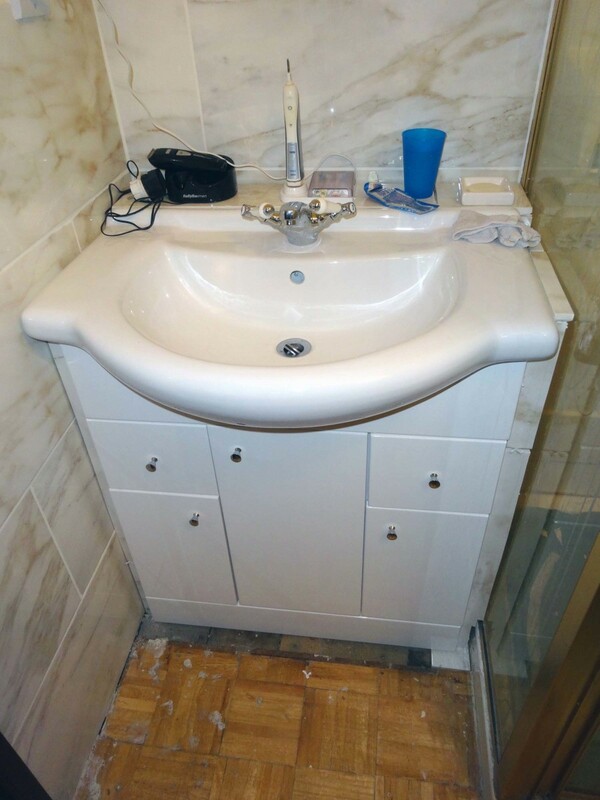 Having completed the major renovations, and replacing just about everything other than the shower unit itself, the toilet and the door, we gave the shower unit a good clean ready for use. 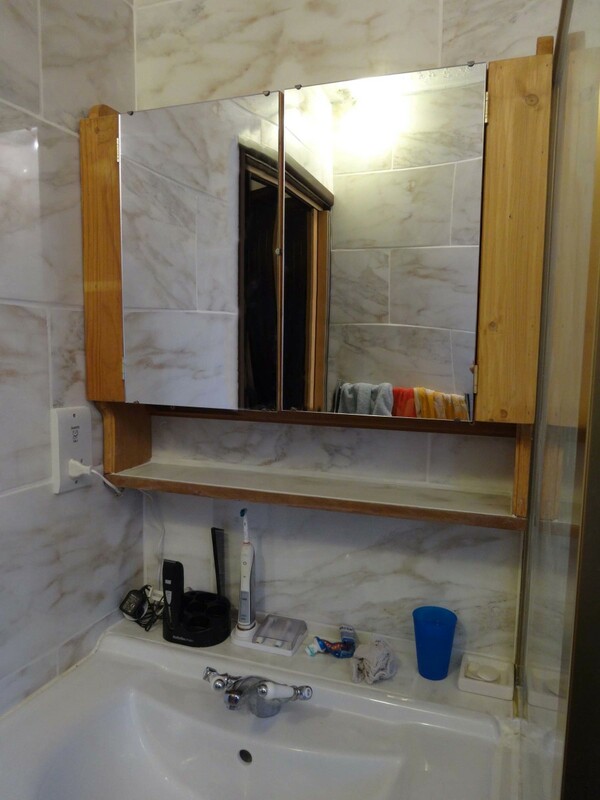 The only jobs remaining were to make the bathroom cabinet to fit above the vanity sink, which is detailed in a separate step by step article; and then installing a false ceiling to make it level. 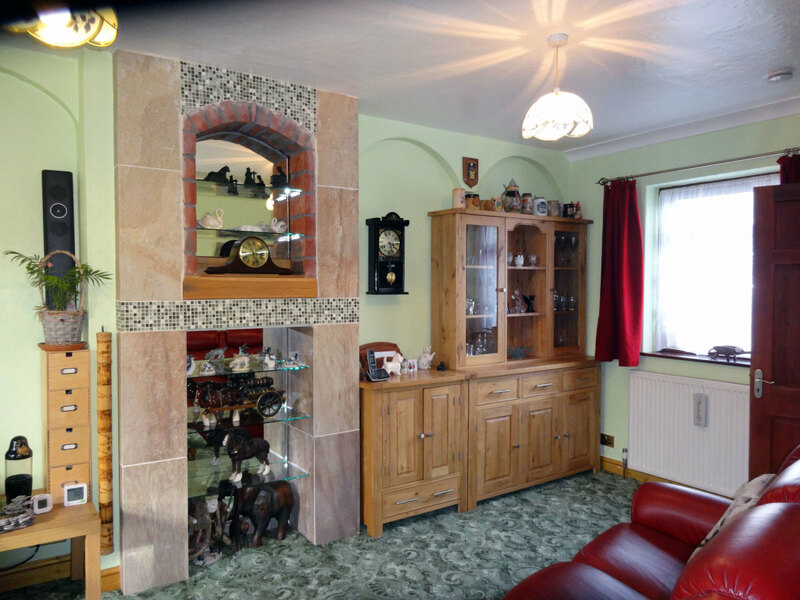 Having removed the skirting board and tiling from floor to ceiling (keeping the tiles straight and level) it became abundantly clear that like the walls and floors, the ceiling was not level; typical of an old English house. Because it was so obvious, rather than try to fudge the top I decided to install a false ceiling just two inches lower than the original. As the tiles were almost 1/2 inch thick and level they provided the ideal ledge on which battens could be placed. The battens would also need to be secured to the rafters of the existing ceiling at regular intervals to keep them from bowing and give them the support they needed to support the plasterboard. Therefore I needed to know where the rafters were; these I located and marked up with the use of a bradle by making holes at regular intervals in the existing ceiling. If the bradle went straight through it was just plaster, if there was some resistance but springy it was a lathe, and if solid then a joist; with a few pilot holes it did not take long to work out where the joists were. Then it was just a case of measuring up the gap between the batten and ceiling at each point along each batten, at regular intervals (every 16 inches) and cutting individual spacers from scrap wood; these being used to securely screw the battens to the existing ceiling keeping them (unlike the ceiling) level. 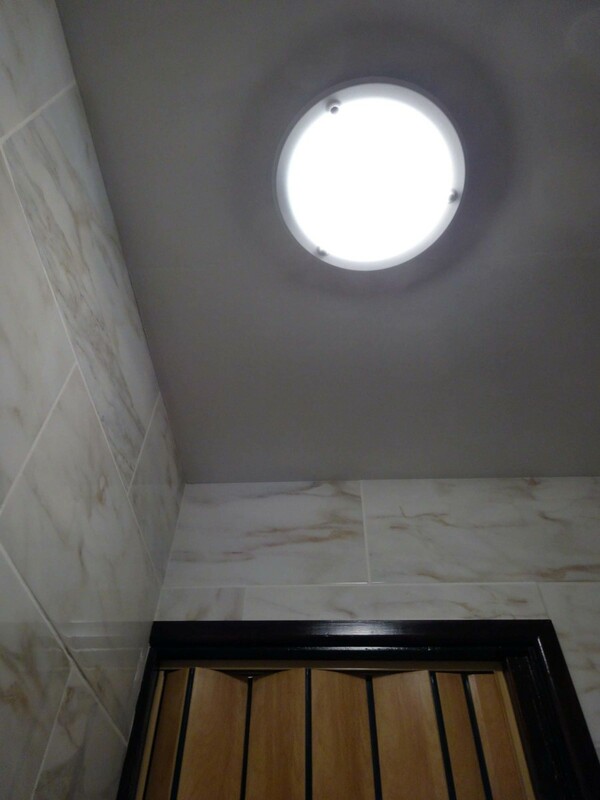 Before fitting the plasterboard I also needed to lower the light fittings to secure to the new ceiling; we took this opportunity to replace the existing lights with a modern lighting unit suitable for bathrooms. Fitting the plasterboard itself was straightforward enough, with help from a friend to hold the plasterboard while I securely screwed it to the battens; to guide us I marked the walls where the battens were so that we knew where to screw. Making and fitting the bathroom cabinet was a separate ancillary DIY project, which I tackled on completion of renovating the rest of the shower room. 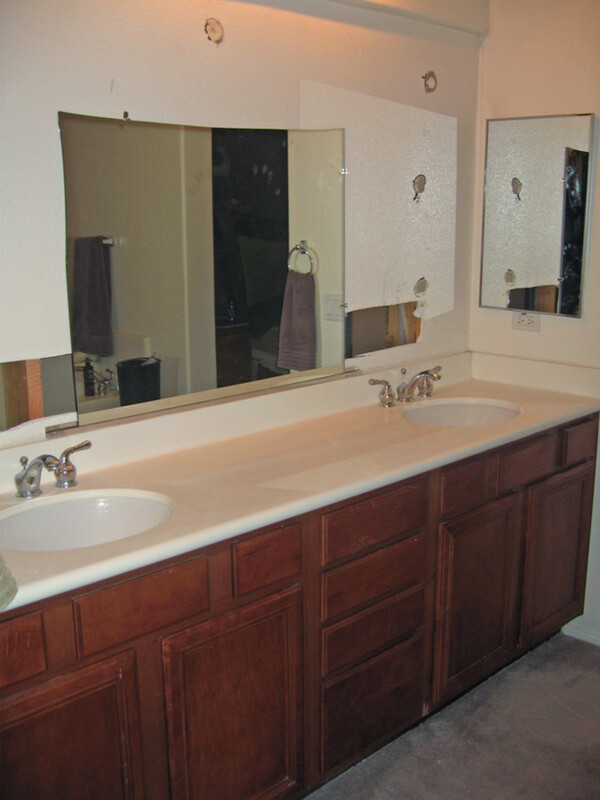 The step by step construction of the bathroom cabinet is described in a separate how to article. Essentially I wanted a bathroom cabinet that was made to measure to maximise on available space and provide maximum storage space. Obviously there is nothing in the shops that meets my requirement that is the right size, so I decided to make the cabinet myself (predominantly from scrap wood); and designing it to incorporate two large mirrors on the doors. Like a kitchen wall unit, the main bathroom cabinet has been designed to fit 18 inches above the sink unit; with an open tiled five inch shelf suspended below it; and for added storage, and open shelf on top. The two doors were designed to fit exactly the size of two large acrylic mirrors I bought from Amazon for just 20 each. I love the acrylic mirrors, their only downside is that they are flexible and therefore have to be fitted perfectly flat otherwise you get distorted image; which for a bathroom mirror may not be a great issue. 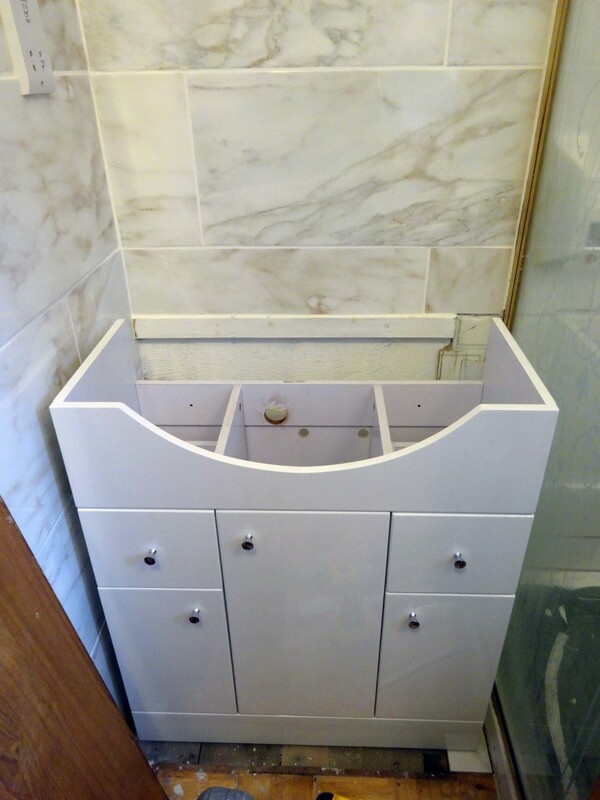 The other design feature of the bathroom cabinet was to make the internal shelves adjustable, so that they can be best utilised for whatever is stored in the cabinet. Would You Tackle a Major Makeover? I would go the whole hog and do it all myself. My partner always does the DIY. I get friends to help me. I would only call in the professional only when absolutely essential. I would never attempt to do a major makeover. I would always pay someone else to do it. Thanks all for your feedback and comments; greatly appreciated. Your project turned out so nice it's easy to see how this could cost a lot more if you had to contract out the work. The choices you used for the walls and floor I really like. Really good job and information. Love all the tips and photos. Great lens! Looks much better with new fixtures in there. Wow! That was total makeover of your shower room. I like your new shower room. Excellent job, you have done well in explaining how you did it, but I don't think I will try doing it. 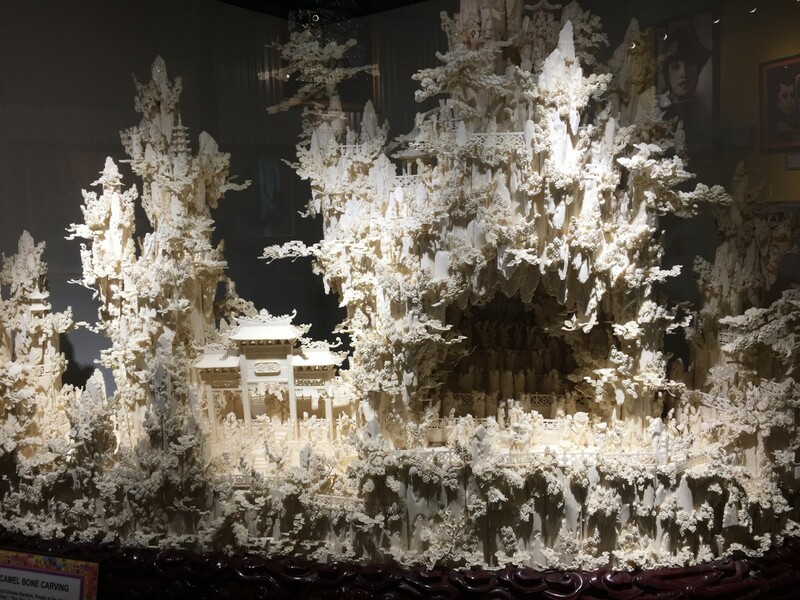 The end result is worth all the hard work, thanks for sharing. That's amazing! What a difference! This was a huge undertaking. Bravo! Such a dramatic improvement. You really know how to take charge of a makeover. I love your new shower room - so professionally done! I'm going to tackle my small room too - one day! Another great lens on remodel. I loved the plinth one too. 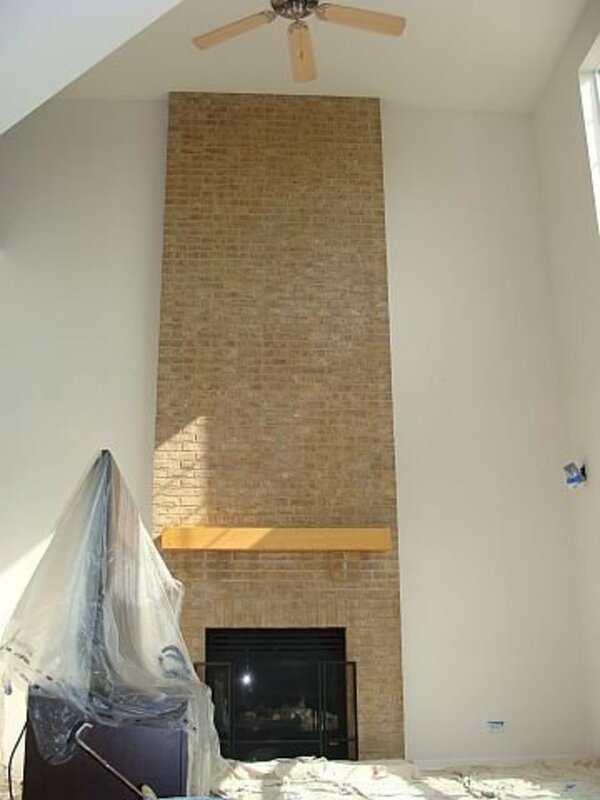 I don't expect to be doing any remodeling, but love seeing how it's done. Thanks for sharing.